Step 1 Brush chicken with oil. Combine the garlic salt, paprika, pepper, basil and oregano; sprinkle over chicken. Grill, uncovered, over medium heat or broil 4 in. from the heat for 4-7 minutes on each side or until a meat thermometer reads 170°. Step 2 Arrange romaine and tomato on plates. Cut chicken into strips; place over salads. Drizzle with dressing. Sprinkle with croutons if desired. Nutrients per serving: 236 calories, 8 g fat (1 g saturated fat), 63 mg cholesterol, 653 mg sodium, 17 g carbohydrate, 4 g fiber, 26 g protein. Diabetic Exchanges: 3 lean meat, 2 vegetable, 1 starch, 1 fat. 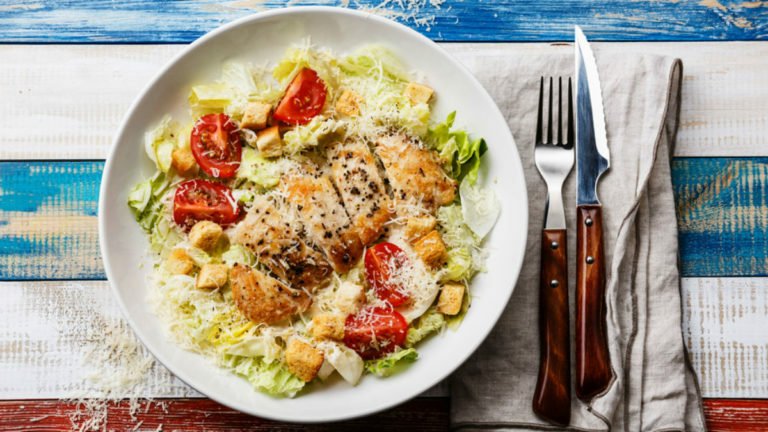 This delicious Caesar salad with a tender grilled chicken breast is a great lunch that satisfies. It fits perfectly into a weight loss diet plan.